VW Introduces 'World's Most Efficient' Car At Geneva Motor Show : The Two-Way The company says the plug-in, diesel hybrid gets 261 miles per gallon. The futuristic two-seater is not in production, yet, but VW says it plans to use "handcrafting-like production methods" for the car. Two new Volkswagen hybrid XL1 model cars are displayed during a preview of Volkswagen ahead of the Geneva Car Show in Geneva. At the Geneva Motor Show on Tuesday, Volkswagen introduced a futuristic-looking car that the company says is the "world's most efficient." 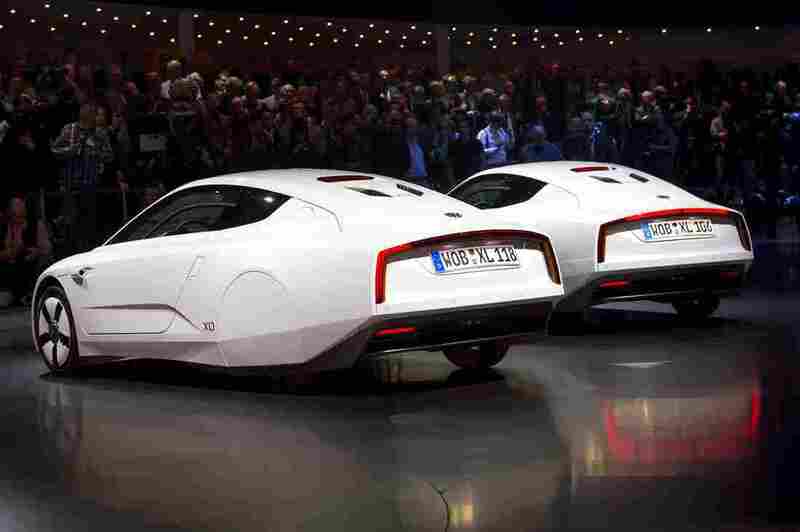 VW's XL1 is a two seater, plug-in, diesel hybrid that the company says gets 261 miles per gallon "with an all-electric driving range of a little over 30 miles," CNN reports. "With an emphasis on efficiency, the car's performance will not be a big selling point. VW claims it will go from zero to to 62 miles per hour in a lumbering 12.7 seconds. Top speed will be just under 100 miles per hour." "That said it feels pretty odd to drive around town. The throttle takes a firm prod and the car whines away, bobbing gently on its springs. Skinny Michelins crash through pot holes, the unassisted steering has a strange, over-centre feeling, although the regeration and friction brakes are combined well in one pedal. For all that, the moulded seats are very comfortable and the matt-black and piano-black interior, which was designed by a Brit, Andrew Hart-Barron, is delightfully simple and unadorned." The XL1 is still not in production. CNN reports VW plans to build the car using "handcrafting-like production methods."